Analy Community Solar Program off to a good start with $1,000 donation from Synergy. - Synergy Solar & Electrical Systems, Inc.
Analy Community Solar Program off to a good start with $1,000 donation from Synergy. On July 1st, Synergy kicked off the Community Solar Program for Sebastopol Schools. The first signed and installed customers, Dominic and Ellen Houlemard, signed up to install solar shortly after the kick off. 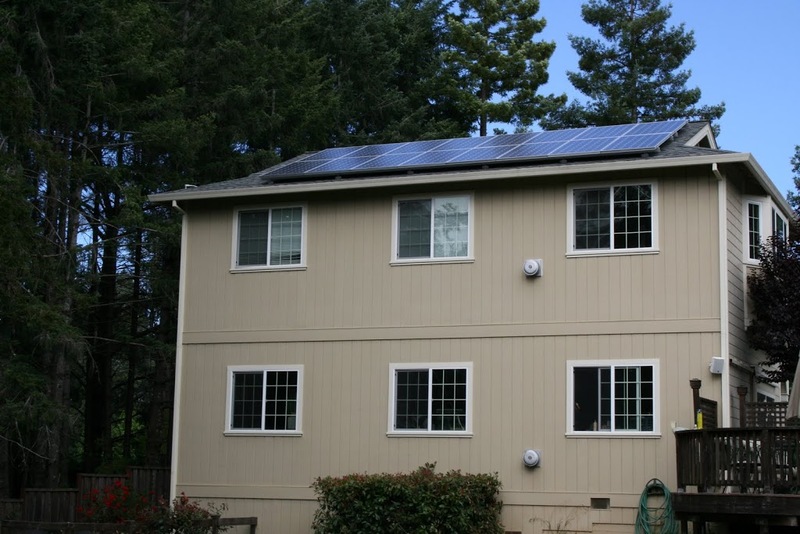 Synergy installed a 5 kWh CEC-AC rated solar system at their home consisting of 24 Sharp 240 watt panels, and the new Enphase M215, 215 watt micro inverters with Enlighten performance monitoring. Analy High School received a $1,000 check from Synergy, benefiting the Football program, where Dominic’s son plays. With the new 2011-2012 year beginning, it is our hope the Synergy Community Program will provide Analy with much-needed funding. “We want to thank you and your staff for the excellent design and installation of the roof-mounted solar system at our house. In just under a month, we have silently generated over 1 MWh of electricity, doing our small part to reduce dependence on foreign energy sources. All aspects of the project were executed flawlessly. The Synergy crew was fantastic, working with PRMD and PG&E as required, and answering our endless technical questions. 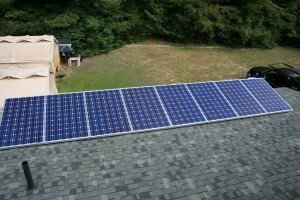 There were several reasons we decided to install solar with Synergy. We were interested in a local company that used local resources. The Enphase equipment, designed by our neighbors in Petaluma, provides up-to-date electricity production status information. It is effective in a variety of shading conditions, maximizing production on these foggy Sebastopol summer mornings. Also, the Sharp panels are assembled here in the United States, which was a big plus for us. 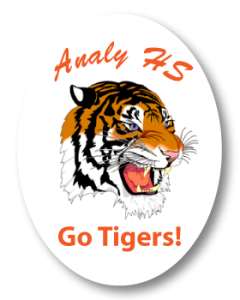 Synergy employees live and work here in Sebastopol.As parents of Analy student athletes, the contribution made to Analy Athletics on my behalf to the Synergy Community Solar program was an unexpected bonus. The attached photo shows the Analy football team in our yard prior to the synergy installation. 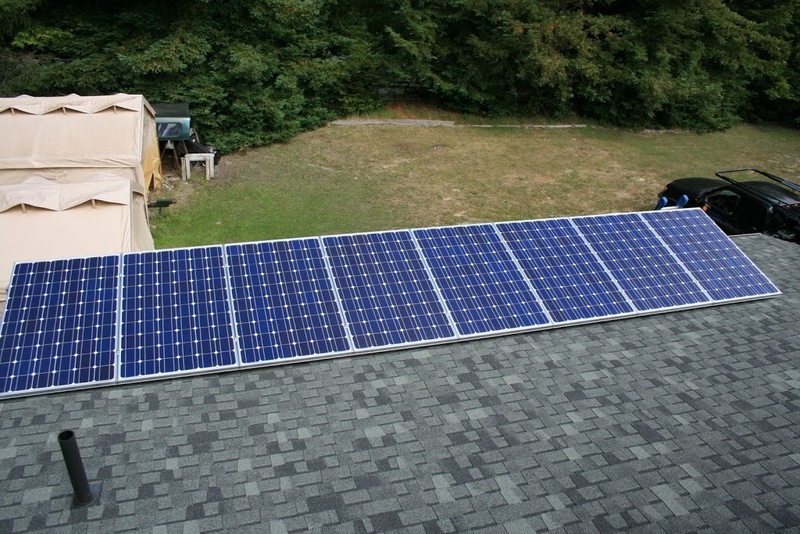 Our primary reason for installing solar was as an investment. With the bond, stock, and real estate markets feeling more like a roller coaster than a sensible place to grow our retirement nest egg, installing solar will not only add to the value of our home, it will reduce our monthly expenses, and is a great hedge against rising energy costs. One less thing to pay for in seven years as the price of energy increases! Synergy provided competitive pricing and a secure return. 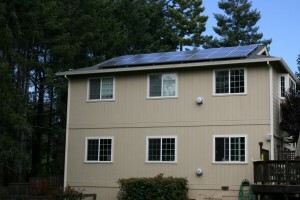 Synergy is a Sebastopol based solar installation company serving Sonoma County for over 20 years. We are launching a new community Solar program to help fund local schools. We are primarily a word of mouth company focusing our resources on our customers and local community. Please join us in reaching our goal of making a difference for Sebastopol children as well as contributing to local economy and the environment. 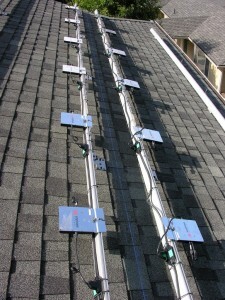 The system was installed in two arrays, 16 panels on the main roof. 8 tilted panels facing west on Garage. The system is up and running. Dominic likes seeing how much energy he is producing every day, and how much he is saving.